If you're getting tired and frustrated of losing weight, don't give up. With the advancement of science and technology to aid us in achieving a healthy lifestyle, there are other options in the so-called journey of losing weight. I have good news for you from Blue Water Day Spa :) As we become more and more exposed to toxins – from the unhealthy food that we eat to the pollution we encounter on our daily commute across the metro, our body becomes heavy because of the buildup of waste, leading to a loss of energy and an uncomfortable disposition. 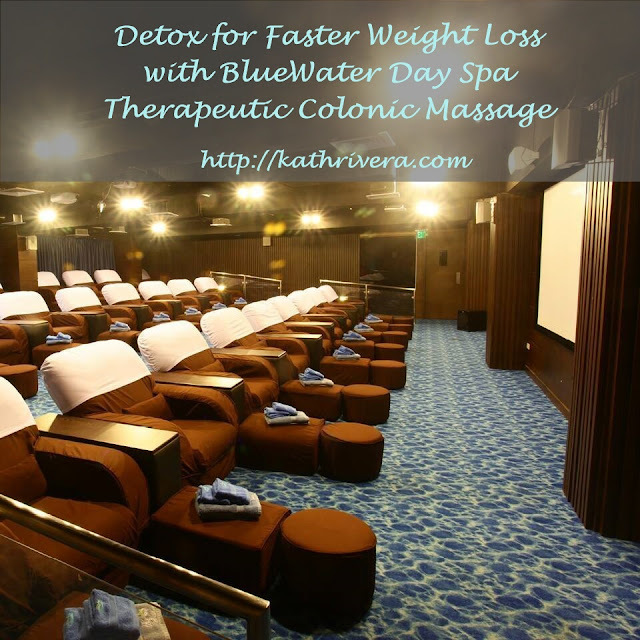 Detox and regain your energy through BlueWater Day Spa’s Therapeutic Colonic Massage, the newest and most effective detox management treatment used by celebrities like Christian Bautista, Miss Universe 2013 Third Runner-Up Ariella Arida, Ken Alfonso and Wynwyn Marquez. Combining medical science with BlueWater Day Spa hospitality and relaxation, the Therapeutic Colonic Massage helps gently remove excess toxins from your body, starting with those that have accumulated in your digestive system. Enjoy the full-hour treatment, made more relaxing with the use of chamomile oil, in the calming ambience of the BlueWater Day Spa suites. Though the massage on the abdomen itself takes approximately 20 mins, you will enjoy lasting results. we can say its a fun way of weight loss.